Redefine a room with this distinctive adjustable mirror featuring satin nickel finish brackets. This contemporary and modern style wall mirror showcases cut corners and clean lines. The rectangle shape tilts forward and back for your optimal viewing angle. Tilting wall mirror. Satin nickel finish brackets. Solid brass brackets. Beveled glass. Bathroom Mirror / clean and sophisticated design! 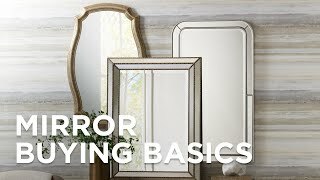 Can this mirror be hung either direction? What is the actual width, 23.5 or 28 inches? BEST ANSWER: Hi - the overall width with the side arms is 28". I ordered two of these mirrors for a jack and Jill bath. They are beautiful !